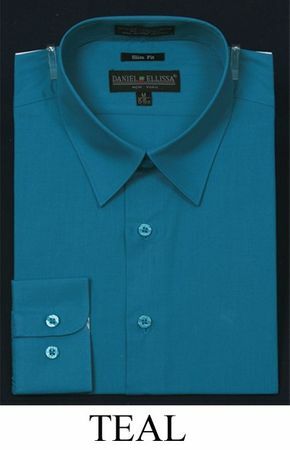 A teal slim fit dress shirt would look so good under a black slim fit suit. If you're a fashion minded guy and like your dress shirts slim fit, you need to rack up big time with these colorful slim fit dress shirts by DE. Featuring the style that guys who love tighter fitting clothing and ready for the club. Made of cotton/poly.